Most of our table tennis tables are foldable and can be stored away in a space-saving way. An easy-to-use folding mechanism and a low centre of gravity make for easy handling and ensure stablility. Easy moving of a table tennis table sometimes depends on the number and size of transport castors. Recommended are table tennis tables with big double transport castors with a rubber coating. They can easily be moved by kids and adults alike. The playing behaviour is mainly determined by the rebounding of the ball. The thicker the table tennis board and the more torsion resistant the construction, the higher and more steady the table tennis ball will rebound. An anti-glare playing surface and the option to play on your own (playback position) as well as integrated racket and ball holders influence the ratings in terms of playing comfort. A sturdy construction with solid feet and cross-brace support ensures stability and an even board. Additionally, the kind of board, the sturdiness of the frame, castor brakes and the general quality are being considered. High stability improves the playing quality, ensures durability of the board and safety during play - especially for kids. 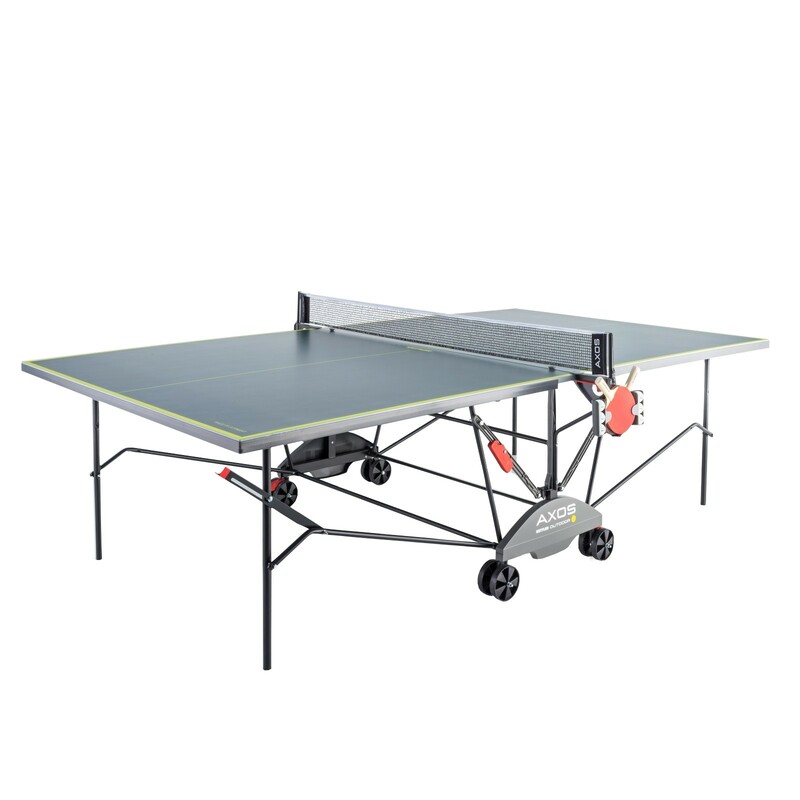 The Kettler outdoor table tennis table Axos 3 is ideal for a quick table tennis match, because assembly and disassembly are quickly and easily done. The Kettler outdoor table tennis table Axos 3 is suitable for starters and mass athletes, who want to start quickly a match without much effort. The fixed net with clamping device is directly attached to the table and makes it immediately ready to play. The high-quality aluminum composite board is permanently weatherproof and offers very good ball bouncing thanks to special coating. The anti-glare features are great as well - even for bright sunshine, the table is good to play. The four steerable double wheels let the table well and safely be moved even on grass. The practical ball and bats holder is included in delivery. It's very easy to set up. Very good bounce. Nice looking table. A decent size. Just a brilliant entertaining game. Seems a good quality table, and a good ratio price quality. Takes some time to build and you need to be two in order to fix some parts. Kettler table tennis racket set Champ In stock! Kettler table tennis cover Universal In stock! Kettler table tennis ball Outdoor pack of 3 In stock! Kettler outdoor table tennis table Axos 3 add to comparison list.